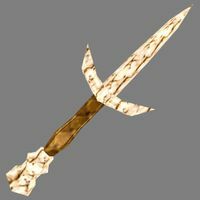 This dagger can be obtained by searching in an altar trough in the Shrine of Pitted Dreams, within the Sixth House base Mamaea (southeast of Gnisis). The unimpressive-looking Fang actually deals the most stock damage (base + pre-enchantment) of all short blades in the entire game (including all official expansions and plugins), except against foes immune to shock, in which case the 10–35 base damage of the Goblin SwordTR has a 2-point edge. In the vanilla game, the closest to equivalence is the Daedric Wakizashi at 10–30 (however, it can be custom-enchanted to deal 20–58 in Shock Damage, or even more in Fire or Frost Damage, versus the Fang's 20–40, making the Daedric Wakizashi by far the most potent custom short blade in the game.) A character not yet capable of enchanting or paying for the enchantment of such a weapon can obtain the Fang relatively risk-free by using Invisibility to get to it, then heavily boosted Chameleon and Sneak to steal it, then Invisibility to get back out again; Chameleon potions and gear are fairly common and are effective when used in combination to exceed 100 points of the effect. This is probably the ultimate weapon for mages and thieves, given its light weight and high damage. This page was last modified on 15 March 2019, at 17:13.